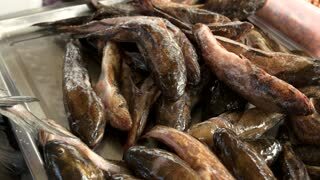 Search Results for "frozen fish"
Fresh frozen gobies closeup. Frozen fish on the fish market. 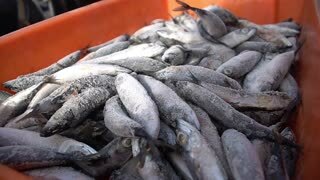 Sale of fish. Winter Ice fishing concept. 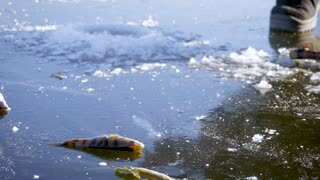 Perch fish lies on frozen lake ice. 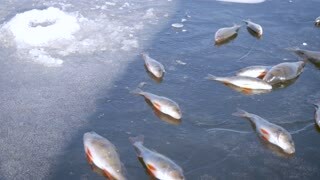 Frozen fish. 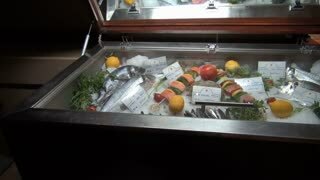 Freshfish market. Fish sale in market. 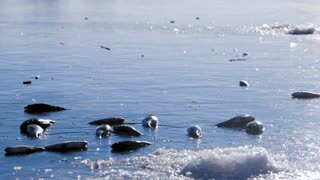 Salmon fish on ice. 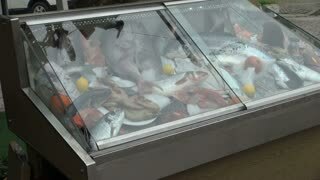 Fresh fish on ice for sale at market. 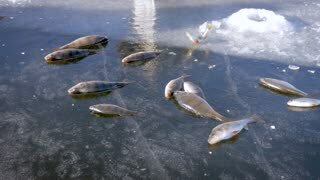 Bunch of raw frozen fish on ice. 1940s: Man cuts skin off frozen fish, boy bites and tears skin off fish. Woman and girl bite skin off fish. Man dips fish into can of seal oil. 1940s: Hands pick up piece of frozen fish. 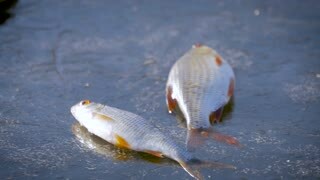 Fish on ice. Hand takes fish from cooler. Hand drops fish in pot. 1930s: Men chop frozen bait on deck of ship. Hands display basket of frozen fish. Men attach fish chunks to hooks on trawling lines. Young chef preparing frozen fish fingers in deep frying oil. Heat, steam, motion, and action while dipping the frozen products into the machinery. Young chef preparing frozen fish fingers in deep frying oil. Heat, steam, motion, and action while dipping the frozen products into the machinery. Close up of hands choosing the best ones. Raw fish burger patties turning on a white plate. Frozen fish cutlets defrosting inside microwave close-up. 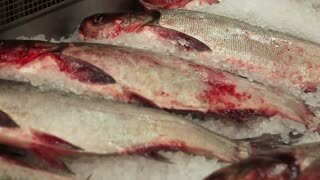 A close up shot of a frozen fish being sold in the supermarket. The fish is big and edible. Moscow, Russia - 20 May 2016: Department of frozen fish in supermarket. People buy foodstuffs. Retail Food Industry. 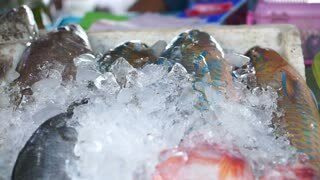 Variety of fresh frozen fish in ice at the store. Full HD food stock footage.